Writes 2x nore than a graphite pencil. In April I bought a pack with three pencils in my local Morrisons (a supermarket chain from the North of England) for £1.50 (~$2.30; €1.75). £1.50, that’s very cheap – per pencil it’s cheaper than a typical, branded woodcased pencil. If you by the Matic in bulk you can get it even cheaper (i.e. ridiculously cheap). Other lead diameters (0.5 mm and 0.9 mm) and other looks (e.g. a girly, dotted version) are also available. The clip colours of the “default version” currently on sale in Europe remind me very much of Lamy’s limited edition colours Aquamarine and Lime2. The colours used for the clips seem to have changed since this pencil has been reviewed by Pencil Revolution and Dave’s Mechanical Pencils, but the reason for the colour change might be geographical rather than temporal. I haven’t used this pencil in the past, but my pencils’ erasers perform very well, unlike Dave’s specimens. This could indicate that the quality of the eraser might have improved …or the quality of the eraser might vary depending on the origin of the pencil3. These pencils don’t seem to be as common in the UK or Germany as they are in the USA or New Zealand …or France, I noticed this pencil in the French TV series Spiral (Engrenages). 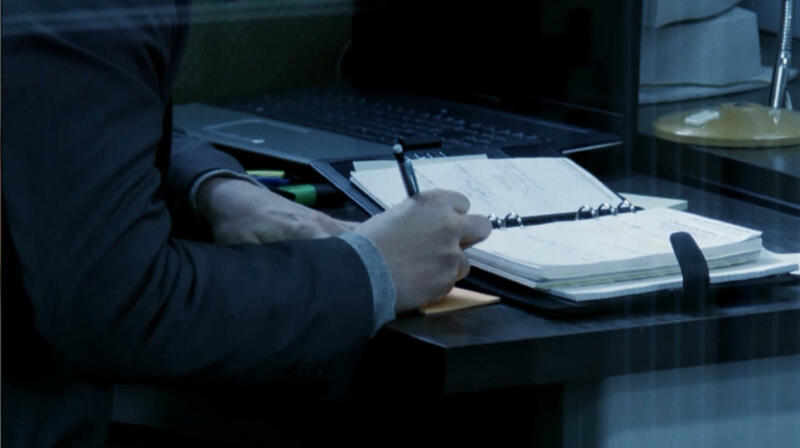 I’ve often seen similar looking, but different, pencils with a similar grip section supplied as no name stationery in offices or supplied as freebies usually with company logos printed on them, but the BIC Matic isn’t a common sight here. 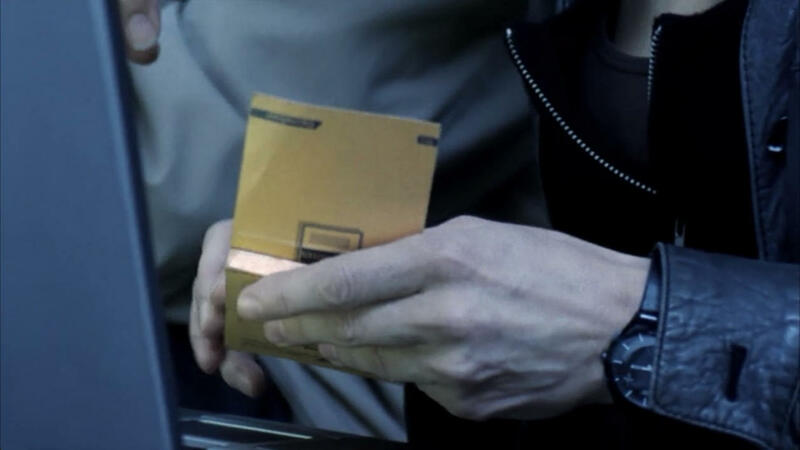 Looking at them my first thought was that they’d be uncomfortable to hold because they are so slim, but actually they aren’t. With more than 8.0 mm at the grip section and more than 7.5 mm at the at the body their diameter is bigger than that of typical hexagonal pencils (7 mm edge to edge, 7.5 mm vertex to vertex). What about the claim that this pencil writes 2x more than a graphite pencil? This might be an accurate claim for many users, but will largely depend on how you use your pencils4). The length of the three leads per Matic added together is twice the length of the lead in a woodcased pencil. 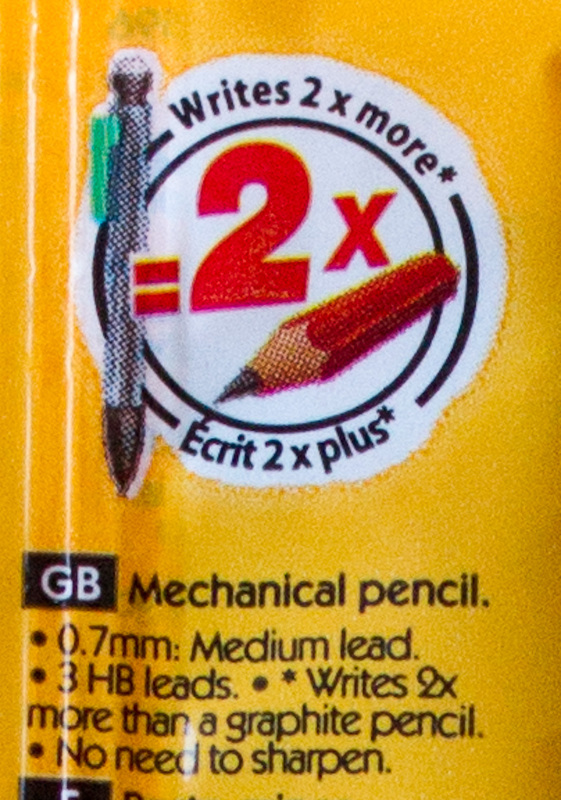 The “2x claim” is actually the same on the 0.5 mm and on the 0.9 mm version of BIC’s mechanical pencil, so it’s probably based on the overall length of the leads provided. In reality your use would determine how much of the graphite you’re actually using. 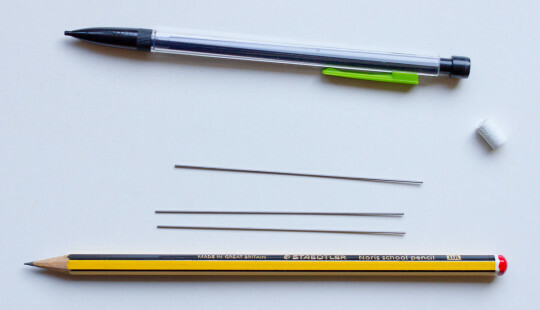 If you sharpen your woodcased pencil a lot you might not even use all of the central 0.7 mm of the lead, but if you don’t sharpen that often and rotate the pencil you might be using more than the central 0.7 mm of your pencil’s lead. Want to double the 2x more? If you see the statement “writes 2x more” as a personal challenge that you want to top this paragraph will explain what you need to do to double the BIC Matic‘s 2x writing with a normal, woodcased pencil. The trick is to use as much of the central part of the lead as possible. The central part you use should have a diameter of at least 1 mm. Done? Congratulations. You have now used twice as much of the lead (0.385 mm3 per mm of lead for the Matic compared to 0.785 mm3 for the woodcased pencil). In the following picture you can see a Black feet Indian Pencil with a diameter of more than 1 mm for the “unused” part of the “lead cone”. 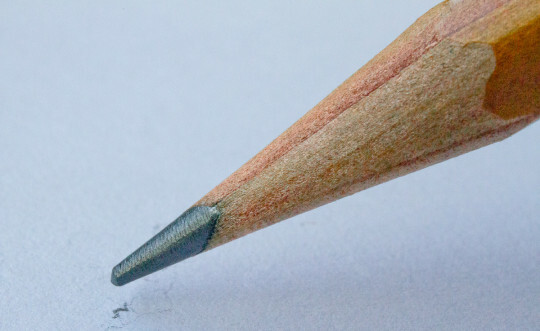 By rotating the pencil after every few words of writing the average writer should easily be able to produce a line of about 0.4 mm width, or even less if you rotate the pencil more often. You also wouldn’t want to waste graphite when sharpening, so if you really want to increase your use the graphite you could a sharpener with a point adjuster to avoid removing graphite from the central part of the lead5. A suitable sharpener is the Deli 0668 – other sharpeners with point adjusters are available from DUX, M+R, Dahle, Carl and other manufacturers. Finally, to avoid wasting the last few centimetres of the pencil: use a pencil extender. There’s another argument in favour of the woodcased pencil: the typical mechanical pencil can’t use the last centimetre or so of a lead, just because of the way the grip mechanism works. You can find more information about this at Lexikaliker. Thanks to Sean‘s help I got my hand on a few Staedtler Integrity pencils a few years ago. The Integrity wastes less then 2 mm of the lead (the Matic wastes about 11 mm)6. I’d like to thank Sean for the Blackfeet Indian Pencil seen in this blog post. The screenshots in this blog post have been taken from episode 7 and episode 9 of the third season of Son et Lumière’s Engrenages. I believe that the use of the screenshots shown in this blog post falls under “fair dealing” as described by the UK Copyright service.